Recently Business Week featured Activism 2.0 slide show bringing in different ways people are venturing into the internet with online philanthropy. "Online activism is branching out beyond the e-mail entreaty to give and get involved. Organizations dedicated to saving everything from lives to the environment are tapping new social Web tools to drum up support online, offline, and for the bottom line. In the process, they're spurring a new generation to get out and do something besides sign up and be counted." Click to Save Darfur: The Genocide Intervention Network has launched an Internet-calling application that can identify phone numbers for local politicians and then dial them for the member, providing scripted talking points for the conversation. It also allows members to sign up for e-mail alerts with links to articles the organization wants to boost in the "most read" rankings on news sites. Help Just a Click Away: Two men, whose wives endured serious illness, run a social networking site, LotsaHelpingHands.com, to help mobilize family, friends, and communities to support loved ones battling illnesses. Nearly 10,000 support communities have been formed on the site, offering to provide help with everything from meals to transportation to the doctor's office. When Facebook opened up its social network to third-party software developers, Project Agape founders Sean Parker and Joseph Green saw an opportunity to tap into the site's vast membership to support good causes. Parker and Green developed an application called Causes, which nonprofits customize for Facebook users to place on their personal pages to raise awareness and money. The Habitat for Humanity page on MySpace has more than 5,000 members who post photos of the projects they have built and offer advice about volunteering in local projects. i can share here my first hand experience on internet activism which was a great lesson and inspiration for me as well. somewherein...blog is a group blog, a first kind in Bangladesh which provides blogging in native language with thousands of writers and readers. back in May 2006 the appeal for Prapti, a girl of only 4 years age who was diagnosed with Leukemia, a type of blood cancer. in a third country like Bangladesh, where health insurance is something for ultra-rich only, so for a regular lower middle-class family the cost of treatment can be a question of life and death and many are forced to surrender in the face of economic inability for treatment. the family of Prapti was in such a condition and made an appeal through a family friend in the group blog which is read and accessed by thousands. initially the appeal didn't get enough attention, so i wrote a post with passionate call (a slightly modified english version here) which caught immediate attention to the bloggers and the reaction was phenomenal. thousands of bloggers came forward actively with compassionate heart for the cause, extending financial and other support. overwhelming response both within the country and hundreds from abroad raised fund and helped the family. i myself wrote that post while living abroad, in Singapore. fortunately it raised enough money to support the costly treatment overseas and by the grace of God, the girl is now out of cancer risk and doctors are positive about full recovery. 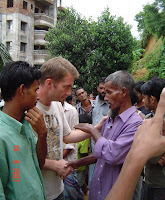 another time when Chittagong landslide hit southern port city of Bangladesh and expats from all over the world wanted to raise money in a central place to send back to Bangladesh, i opened a paypal account and used blog platform to raise fund for the victims. the response was very positive and somewherein...blog authorities organized the relief work and much needed distribution in the disaster zone. both the case of Prapti and Chittagong landslide campaign was two good first hand experience as a testimony how powerful, fast and effective internet media can be. the kind of people willing to come forward for compassionate service and the right media that connects those people, such as internet can be a great marriage - you can believe in it! // National Radio Project also published successes of internet activism in South Korea, how activists in Egypt and Bulgaria are bridging the digital divide for small non-profit organizations, and how an internet radio station helped to galvanize San Francisco peace activists at the start of the second Gulf War. read here.